I cooked a pig the other night and was happy to have some company from a good friend of mine that puts Saint-Emilion Merlots as his favourite wines. When I do an overnight smoke of a pig I like to enjoy a bottle of wine and listen to Coast To Coast AM radio on AM640. I find it hard to open a full size bottle as when I drink a bottle to myself i get a little bit tipsy, not the best idea when you are tending to a 150 pound pig and a bunch of fire. 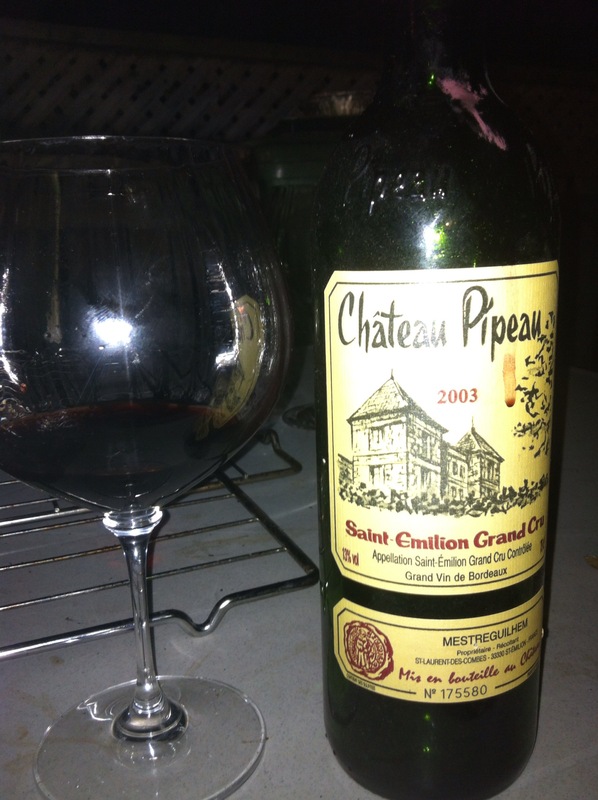 I knew exactly what wine to open and went with the oldest vintage of Château Pipeau in my cellar (besides a couple magnums of the 2000) to see how it was faring 11 years on. Colour of vibrant crimson with the slight emergence of a garnet rim, some fine sediment thrown. Nose of ripe red fruits (raspberry, ripe plum, mulberry) mixed with fresh violets and damp stone. These flavours are replayed on the palate with smooth integrated tannins and a remarkable freshness for the bottle age. Gorgeous, the best value for a premium quality wine in this price point. Great wine to go with great company. Château Pipeau has been a favourite of my beautiful wife and I since we discovered it on a trip to Bordeaux during one of the best meals I have had in my life at L’Envers du Décor in Saint Emilion. Château Pipeau is now part of the LCBO Vintages Essentials program and is widely available, current list price of $38.95, on sale until October 12, 2014 for $35.95.